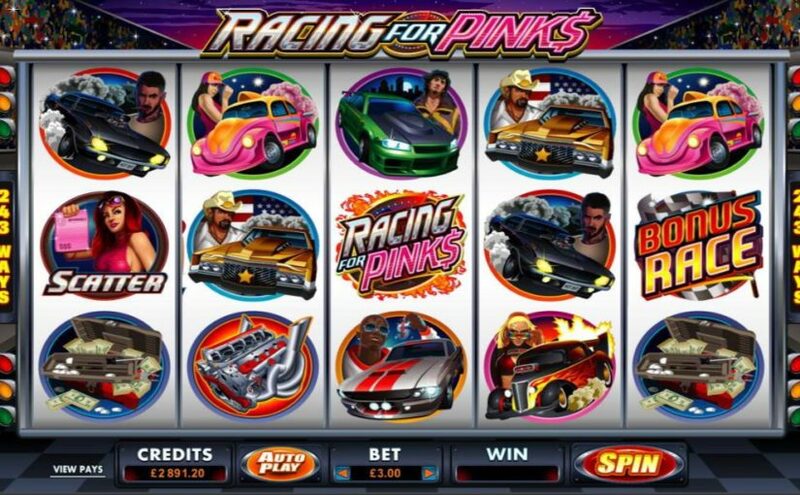 Racing for Pinks Online Slot is an action-packed 5×3 reel game with no fixed paylines and 243 ways to win and it is powered by Microgaming. The game comes with spectacular, fully interactive presentation and a roaring soundtrack that sets the atmosphere for you to race and win some fat cash prizes with your turbocharged racing car! Along with the game’s wild symbol, there are many scatters to look out for. The Free Spins Girl symbol will award you with 30 free spins and a whooping 5x multiplier through them if you manage to get it on reels 1 and 5. During free spins, you can grab the game’s jackpot that stands at a spectacular 150,000 coins thanks to the multipliers! The Bonus Race scatter will trigger Racing for Pinks’ most spectacular feature, the Bonus Race game where you get to bet on racing cars and win up to a 175x multiplier if your chosen racers finish first!